For my latest design project, I’m venturing in to some new, very bright territory. My client/friend is going through a bit of a life change and wanted to revamp her bedroom with a serious injection of tranquility and COLOR. The combination of the two has been a bit challenging to say the least. Per her request, I’ve been doing some serious research on purple rooms. As I’m still working on the finishing touches of the mood board and overall plan for her room, I thought I’d share some of my inspiration as the color choice can be very tricky to work with. So for today’s post, I bring you the PURPLE ROOM ROUND-UP! This was our initial inspiration to kick off the project. 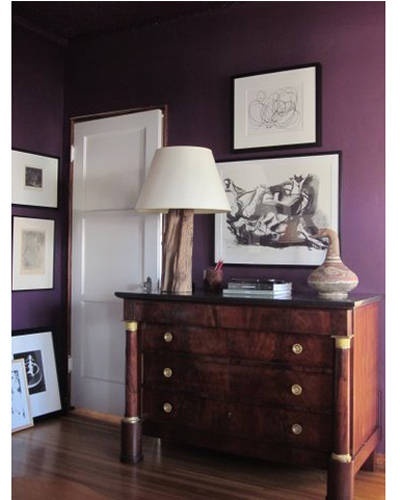 A purple throw quickly turned in to purple walls…. Luckily we’re not taking it quite this extreme, but sometimes you have to go too big and edit, than to play it too safe from the start. A more feminine, softer take on the color. A neutral, more organic feel. Deep, rich, and a little moody. Perfect for a bedroom. 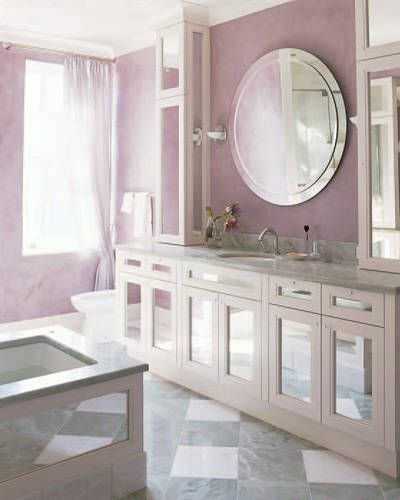 Loving the juxtaposition of feminine colors with the more masculine, modern lines of the paint treatment. I just want to pet grasscloth. I’ve loved it since the first time I saw it in the home of a wealthy friend of my grandmother. And in such a fun color, you can’t go wrong. It’s such a hip take on a traditional design tool. Upscale meets young and funky. Tranquil and fresh when combined with crisp white cabinetry. My bedroom is purple. 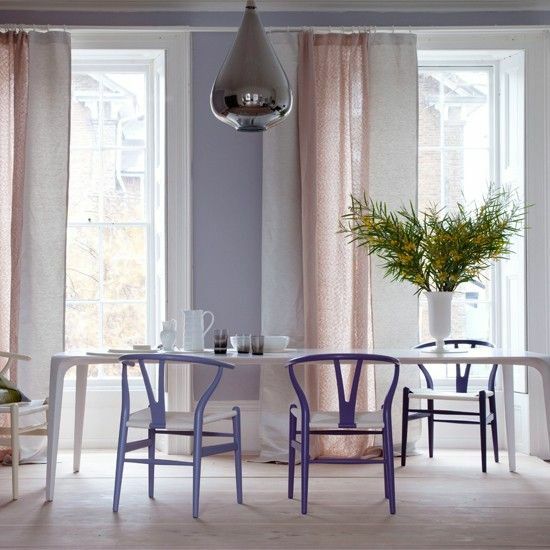 Actually it’s a very light grey/lavender color (heaven by Benjamin Moore). It looks more grey/blue/purple depending on the light. We both love it and it sets of our yellow polka dot quilt and my creamy yellow dresser perfectly. I love the lighter, more grey purples. And yellow is a stellar color to pair with :-). I used a buttery yellow in my room the last two years of college. Great for bedrooms. Marie Schrader would LOVE these rooms!